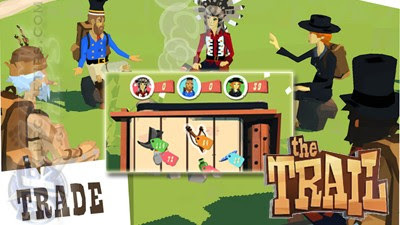 Here's some quick tips on how to generate more Chits and win more Top Trader Gifts in the Android and iOS mobile simulation game - The Trail. - Enter Camp Sites and craft all items that you can. - Sell items and gears that you don't need to other traders. For early game (before reaching Eden Falls), focus on Wooden Carvings and Toy Birds, and increase their Lvls to earn more Chits. - Affects the trading duration and the probability of your items getting sold. 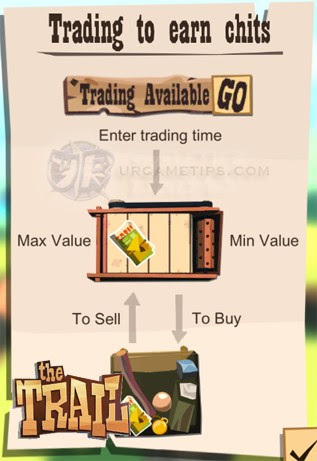 - More Traders will also generate more items to choose from. - If you are the only Trader around, just wait for it to end or place any cheap item that you don't need. Grab the "Top Trader Gift" afterwards. - Red, Blue, and Green Price Tags = Owned by other Traders, items that you can buy. - Place all items and gears that you want to sell on the left side most of the conveyor belt. - Once it moves, you can also move your own items farther to the left to increase their price. - Note: Do not sell newly crafted items that are still under cool-down, because their price are way lower than their original price. - Only buy items, tools, and gears once they are about to get destroyed (right most side of the conveyor belt). This way, you can save more Chits. - Note that you can also retrieve your own items if you want, before they get destroyed. - Contains random items, tools, and gears, but usually a quest item that you need for your current quest. Watch Video For 2x Chits! - Always choose this option to get more Chits. - First, check if you can use your existing items for crafting, craft them to increase their price. - Join and start trading, the more traders around, the better. - Note: It is easier to "flick" the items up or down instead of using "drag and drop". - If you don't have enough items to sell, just focus on purchasing some valuable items from other traders for now. Do this until your bag is full. - Once you are ready, place all items to be sold on the left side most of the conveyor belt. At the same time, buy all items (that you don't own) that are about to get destroyed, then quickly put them back on the conveyor belt. - Once trading is done, always use the "Watch Video for 2x Chits" option. This is the main reason why I suggested the above simple trading method. 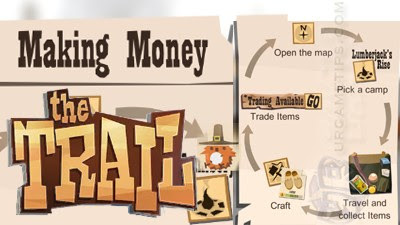 Buy and sell all items that you can to increase your Chits gain per trade. - Now, just repeat the steps. Master these and you'll get easy Chits, especially early game. At later gameplay, campsites will also start to draw in more valuable items like Toy Racoons and Carved Rabbits, use same method to increase profit. - You can also get more "Top Trader Gifts" by doing this, which will help your quest progress a little faster, plus, you don't need to worry about your gears' durability too which is always nice. How To Easily Rejoin and Start a New Trade? - While sitting, slide up to start walking, then quickly select the "Return to Camp?" option. - You can also use the "Trail Map" and select that same Camp to re-enter, choose other Camp if it's not working. - Note: If the two options above are not available, try to restart the game or advance your progress. Best Camp Site Locations To Do This? - Campsites that are beside a ferry, because they usually have 3 Traders present all the time. - Simply restart the game.